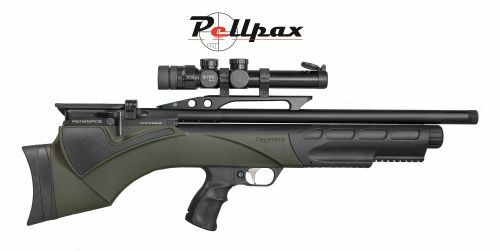 Based on the ever popular Daystate Pulsar, the Renegade has been made to with the same basic design but with a few key changes to make it one of the best PCP rifles on the market today. One of the main differences between the regular Renegade and this HR model is the HR is fitted with a Huma Regulated action that greatly improves shot to shot consistency and enables more control over shot placement at the extremes of the HRs range. The Renegade also comes fitted with a mechanical trigger system with a crisp and predictable let off. The bullpup style stock of the Renegade has been ingeniously designed with excellent balance and high durability. The Renegade also features a Walther Lothar barrel that is of exceptional standard and ensures that the Renegade lives up to Daystates expected performance.